Welcome to the End of the Road. Nothing says privacy like the end of the road, and that is exactly where you will be in the End of the Road Cabin on Elbow Lake. The End of the Road Cabin at Elbow Lake is our personal cabin. Stay here for the view, get a bonus of privacy with the natural wilderness. 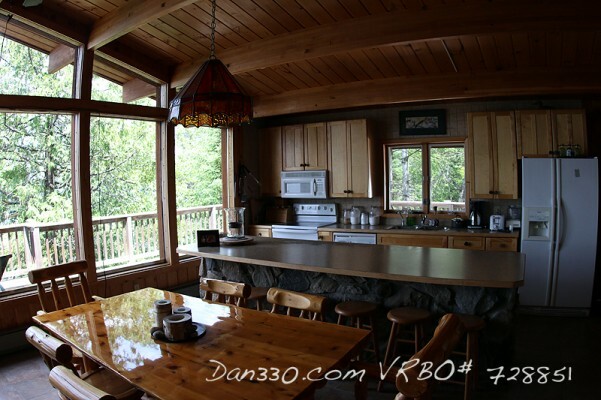 It is perched on top of a rocky bluff with amazing views of Elbow Lake. Three sides walk out to the natural wilderness of Northern Minnesota. With four bedrooms, 1.5 bathrooms, a full kitchen, wrap around deck, screen porch, sauna, and lakeshore, this cabin is everything you want when going up north. Pictures above is a 180 degree panorama during the northern lights. Make sure to check out our page on things to do too! Purchased in 1988, The End of The Road Cabin has been a private residence for our family. From rest and relaxation, to excellent grouse and deer hunting, and fabulous fishing, The End of The Road Cabin has hosted our family and friends alike. For the first time ever, we are making this awesome cabin available to the public. That means you can rent this cabin. What separates us from other great cabins? Two things really. This is a private residence and it has incredible views. 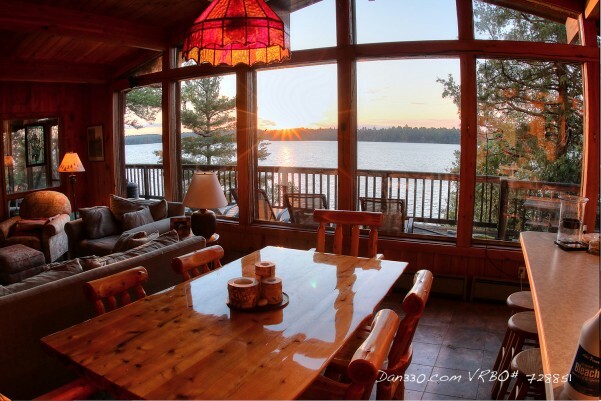 You are perched on top of a granite bluff and face the sunset every night from your personal cabin. You are not part of a resort so you get 100% privacy, which is only enhanced by being at the end of the road. We owned Elbow Lake Lodge for about 20 years and this cabin was our personal refuge on the lake. The Lodge is only 1/4 mile away and when you stay in this cabin, you get easement access to their beautiful beach. If you want to hang out on a private lot and deck and enjoy the sun and views … you can. If you want a world-class beach … you have unrestricted access to one that is a short walk away. I mentioned above that you stay here for the view. It is THE PREMIER RENTAL CABIN on Elbow Lake. The deck offers more than just pretty sunsets. During the day you are perched like an eagle over the lake. From the green pines across the lake and the majestic water of the lake to the starry skies and northern lights, you will always find something to enjoy on our deck. These pictures are of the northern lights, a sunset, and the great views. I wish these pictures did the views justice. You get another feel for them in our virtual tour above. In Northern Minnesota, a great beach is like finding a diamond in the rough. 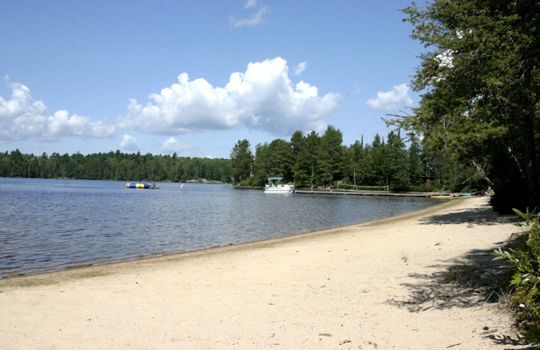 When you stay at End of The Road Cabin at Elbow Lake, you have easement access to the incredible beach at Elbow Lake Lodge. There are two ways to get to the beach: One is by land, and two is by sea. If you have a kayak, canoe, or other boat, you can easily paddle to the beach which is only a few hundred yards away. The other is to walk the “road” (I call it a “road”) because it is just enough to safely drive a car on. Take your floatie for a short walk and enjoy one of Minnesota’s nicest beaches. Winter is an amazing time and you can’t find a much more amazing place than Elbow Lake. There’s ice fishing, snowmobiling, and exploring right out your door. Not to mention those crystal clear night skies!!!! World-class snowmobiling is right on the lake. 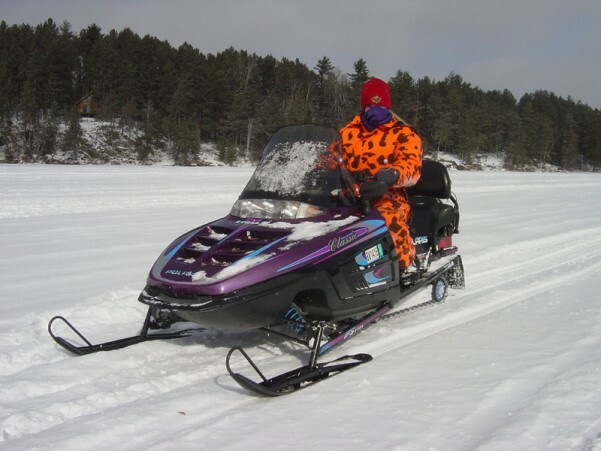 Hop on the Ashwa Snowmobile Trail located just 3 miles down the lake, and you can fly up to Voyageurs National Park for a quick day trip on your sled. Or, head south and tour the hills of the iron range. If you want lake miles, skip over to Lake Vermilion. Elbow Lake also has great ice fishing. Bring up your clam and catch some winter walleye. 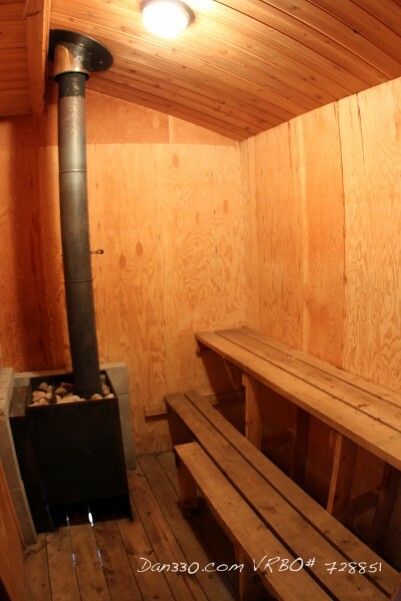 Each evening, you can be welcomed back to the warm cabin and hot sauna. Eat Dinner, and watch the sunset on our HDTV … I mean giant window. The great room is the centerpiece of the End of The Road Cabin at Elbow Lake. I has a huge stone fireplace, a windowed wall facing Elbow Lake, a full kitchen, dining area, and living area. Wrapped around the great room on three sides is a large deck with a screen porch. In the back of the great room is a utility room, a full bathroom and three bedrooms, one with a half bath. The kitchen is a full kitchen with a dishwasher, double sink, microwave, refrigerator, freezer, oven, broiler, stove, toaster, and coffee maker. There is a ton of cabinet space and the cabin is fully stocked with utensils. Just outside the kitchen on the deck is a large gas grill. The Screen porch is located on the side of the great room. It is a perfect way to enjoy the outdoors and avoid the bugs all at the same time. The master bedroom has an attached half bath, windows, access to the screen porch, and plenty of closet space. It sleeps two people in a king bed. The guest bedroom is right next to the kitchen and front door. It also sleeps two in a queen bed, has a closet and walk out access to the deck. The kids bedroom is adjacent to the guest bedroom. It sleeps two in two twin beds. It also has a closet and a window. The bunkhouse is one of my favorite spots at the cabin. 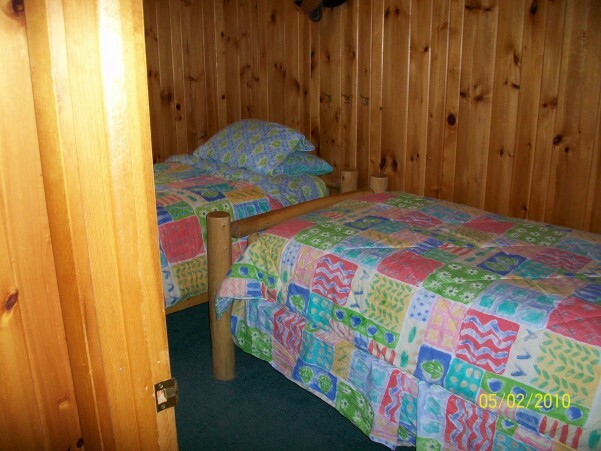 The bunkhouse is a short walk on the deck and has two twin beds and plenty of room for sleeping bags. It has electric heaters to keep it warm all winter long. 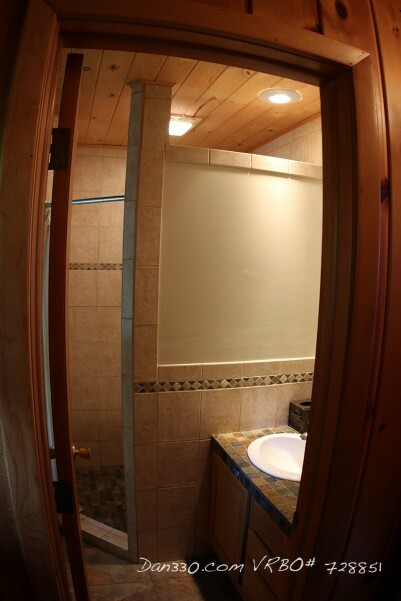 Next to the bedroom is an outdoor shower and a wood burning sauna. The primary bath is down the hall from the great room. It has a toilet, shower, and vanity and sink.